With the powerful 2.25 CHP Mach ZTM Motor, you'll get consistent, reliable performance. The Proform 590T Treadmill not only helps you lose weight but also keeps you fit and healthy. Its powerful motor gives a consistent and reliable performance. The back-lit display keeps track of your speed, time, distance, incline, pulse, and the number of calories burned. It is compatible with iFit Live Technology. The workouts are powered by Google Maps plus Jillian Michaels to keep you on track and your own personalized workout programs that are downloaded everyday to the console. Space saver design too aids in storing it when not in use. Basically, the Pro Form 590 T Treadmill is everything you need to lose weight and stay fit. The Proform 590 T Treadmill features a folding deck which makes it easier to store away when not in use. It includes a powerful shock that helps lift the deck with a soft handed push. Set-up takes a little time depending on how fast you understand the set-up instructions (and if you haven’t lost your reading glasses). Even with its speed and an incline, which raises or lowers the platform, the treadmill is reasonably quiet. It has no noticeable squeaks or noises. Proform 590T Treadmill is compatible with iFit Technology, which truly revolutionizes the way you workout. The iFit technology connects you and your machine to online interactive training tools. You become part of a fitness community that supports you through your fitness or weight loss goals. Users of Proform 590T can compete against other iFit members, they can race and compare their time with community members from all over the world. You get real training at home by a Certified Personal Trainer who creates unique personalized training programs for you that are regularly updated in the console thanks to iFit. The Proform 590T is powered by a 2.25 CHP Mach Z Motor. This motor employs a fan that reduces the noise as it cools down the internal components and helps to extend the motor’s life considerably. We feel that the treadmill’s motor also provides a consistent and reliable performance required if you have a long term plan in place. Because of its per-assembled components, it comes heavy and huge so be sure to place the package where you ultimately decide to unwrap it all. Depending on your talents as a handyman and how well you follow set-up instructions from the manual, it might take more than an hour to set up. It took us (team of three) nearly an hour to assemble and learn the controls to get started. 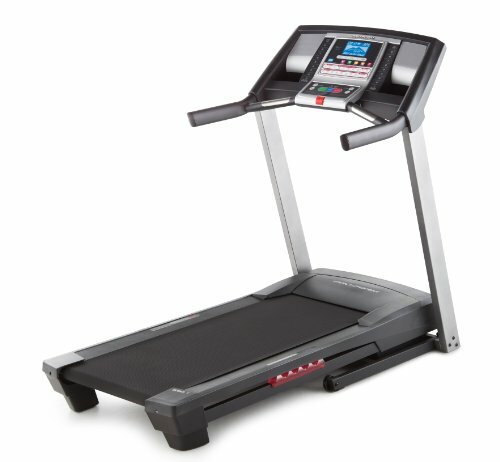 The Proform 590T Treadmill has a 20” x 55” tread belt that is smooth as silk. Furthermore, the belt provides enough length and width for running or walking, though some users might find the length of the belt a tad bit short. The frame is designed to provide a good amount of durability enough to accommodate users weighing up to 300 lbs. This treadmill uses Pro Response Cushioning system to provide a running surface that is firm in the strike area and soft in the take-off zone. Naturally, this provides comfort and control throughout the full stride displacement. One can even enjoy his workout by listening to his favorite music as the treadmill comes with a compatible music port for an iPod and speakers built in. It features a Dual-Grip EKG Heart Rate Monitor that keeps track of the user’s heart rate during the workout. Powered by 2.25 CHP Mach Z Motor with quiet, self-cooling drive system. Has a 6” Backlit Display for easy monitoring of workout progress. Has a QuickSpeed Control for instant change of speed from 0-10 MPH. Features a Quick Incline Control which allows for easy incline changes. With 16 built-in workout apps designed by a Certified Personal Trainer. Has a Dual-Grip Heart Rate Monitor in handlebars to monitor heart rate during workouts. TreadBelt is 20” x 55” which operates smoothly and quietly. The Proform 590 T Treadmill can hold 300 lbs. weight capacity. Space saver design, built-in workout app designed by a personal trainer and you get to be trained by Jillian Michaels, beat that!!! The track length of the Proform 590T Treadmill is only 55 inches long might be a little short for some users with a long stride. Proform 590T utilizes the most technologically advanced system of providing fitness and weight loss programs. You get the workout you want with the built-in workout apps designed by a certified personal trainer. As a bonus, a new workout is automatically downloaded everyday to the treadmill. Your workout results are uploaded to your iFit personal profile. And when you have worked so hard and the results show, you can share your workout with your Facebook friends too.